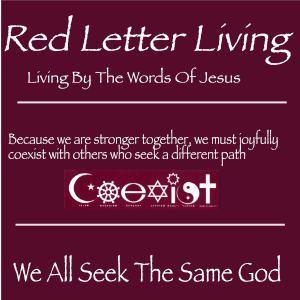 I seem to get a fair share of email and comments about my “religion” posts here at RJsCorner and also over at RedLetterLiving. Some are in agreement, some take the post where I never intended it to go. And then there are others who assume that I hate religion and see me as attacking what they hold as sacred. In this post, I want to try and address those issues. As I mentioned a few posts ago I lead a joyous life as a nuanced skeptic. That is, I see small and sometimes not so small slices of various topics that I question. I don’t hate religion. The graphic here pretty much sums my overall beliefs about religion in general. In my mind, God is not attached to just one religion. In fact, I have come to believe that all the various religious beliefs in the world today, and there are thousands of them, are for the most part made my man. I realize it’s nice to be around people who believe as you do. Religion meets that need for those who require that. When I was part of a couple of different versions of religion in past years I did enjoy the hymns, some of the traditions, and the short-term friends we made there. I was enlightened by some of the group studies, but there were some I had to voice an opposing opinion of and I sadly found those opinions not very welcomed. I am not against religion. I do believe that the church serves a valuable purpose of teaching young minds the fundamental beliefs. But after the basics, it should not be so condemning of the next step a person might take. Do we really need to believe so many things that were invented by men? But more fundamentally, I do sadly believe that most religions almost totally focus on what you are supposed to believe instead of how you are supposed to live your life. Maybe even more damaging is the belief that many have that they are the only ones who have it right. In closing, believe it or not, it is possible to love God and even be a “follower of Jesus” without being religious. I am one of that group. I believe and agree with you. Being someone who was raised a mixture of fundamentalist and Baptist, then marrying a Catholic and still attending the only Catholic Church in the county we live in with many of our friends being members of our church—-I enjoy the community. However, having traveled to over 50 countries and meeting people of many different faiths, I don’t believe just one group has the only “Golden Ticket”. Most of the religions I’ve looked at have some version of the Golden Rule. If only all of us could live by it. Having said that I also feel that our country is going down hill fast and feel there is a connection to that and the fact that the majority of children today don’t seem to be getting ANY religious training. I don’t think it matters that much which religion you choose, as long as you can be okay with others choosing a different faith, as long as we can respect and treat each other the way we would like to be treated. Thanks for your thoughts, Jackie. Yeah, no one church is golden. I really have come to believe that God is ingrained in each of us at birth, but questions need to be answered from young minds. I just wish the answers were more consistent between them.